i was watching the evening new on CBS with Katy Coutic about a pow/mia story, and the name was very familiar to me. the story on Kathy Strong and James is below. The graves shown are the Moreland family in Brierfield. The remains of James Leslie Moreland, a former MIA in Vietnam, were recently identified and he will be buried May 14, 2011 at the cemetery next to his parents, Fred Moreland and Gladys Moreland. ( Beverly Taylor / The Birmingham News ) BRIERFIELD -- There's a spot marked in a small country graveyard near here for the long lost Green Beret. Now, after 43 years of uncertainty, the grave in Ashby Cemetery can be filled. 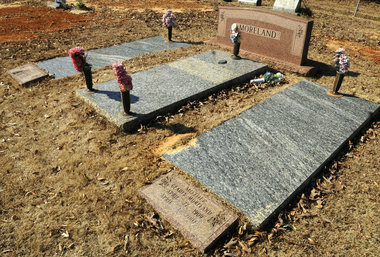 Burial for James Leslie Moreland -- missing in action in Vietnam since Feb. 7, 1968 -- will be May 14, 2011 in this isolated cemetery off Bibb County 2, south of Montevallo. Moreland was born in Bessemer on Sept. 29, 1945, moved to California in high school and in 1965 went to Vietnam as a medic in the elite Army Special Forces. The 22-year-old was presumed dead after a ferocious battle at Lang Vei in South Vietnam. But his body wasn't recovered or identified. Finding the body and securing an ID turned into a decades-long quest until last month, when DNA earlier submitted by five relatives matched remains found at Lang Vei. "It was very emotional coming up on the 43rd anniversary," said Linda Brown, 62, the youngest of the five Moreland siblings. The family had all come to accept James was dead, but they persisted on finding his body, Brown said. "I had never given up," said Brown, who lives in Washington state near sister Edna Anita LaMoine, 73. "I said I wouldn't care if they identified just one bone fragment so we could say, 'Yes, it is our brother.'" Unknown to the Moreland family at the time, a Christmas Day gift in 1972 to a 12-year-old girl added one more person to the long pursuit for answers. Kathy Strong of Walnut Creek, Calif., remembers asking for an MIA bracelet because it was the cool thing to have at the time. Santa Claus brought a bracelet with the name: James Leslie Moreland. Now 50, Strong became close to members of the Moreland family after her hometown newspaper, the Contra Costa Times, several years ago chronicled how she had worn the bracelet for decades and had grown increasingly interested in Moreland's story. Strong plans to attend the upcoming burial in Alabama, where she said she will relinquish her bracelet to be buried with the remains. "My promise was to keep it until he came home and then give it back," Strong said. Moreland's commanding officer, Paul Longgrear, who is an ordained minister, will officiate the service. 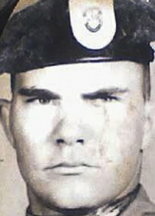 Longgrear led a strike force unit, which included Moreland, to help defend a Special Forces camp near the Laotian border. The camp was a "thorn in the side of the North Vietnamese," Longgrear said, and on Feb. 6, 1968, it came under heavy attack from enemy tanks. He said he remembered Moreland being seriously wounded in the head as he went to fetch a machine gun in an open area, aiming to keep it out of enemy hands. In the ensuing explosions and subsequent takeover, some men escaped, some were captured, some were killed. Moreland's body was never recovered. "He was a great guy -- a great looking kid with a lot of confidence," said Longgrear, who lives in Pine Mountain, Ga. "He had that swagger. Green Beret tend to be that way." Moreland's early childhood years were spent in the Birmingham area and in Selma, his sisters said. He went to Lyman Ward Military Academy in Camp Hill in the eighth and ninth grades. The family moved to southern California in 1962, and Moreland became an all-county football player at Western High School in Anaheim, playing on the same team as Andy Messersmith, who went on to become a Major League baseball player. After graduation, Moreland attended Fullerton Junior College but ultimately followed his two older brothers' footsteps into the military, albeit a different branch. "I tried my best to get him to come to the Navy," chuckled retired Navy Seabee and older brother Robert D. Moreland, 75, of Lakeside, Calif. "But he liked to skydive." When on June 5, 1978, the Army declared Moreland "presumed dead," his mother, Gladys Parks, organized a memorial service for him at Ashby Cemetery and dedicated a large granite marker in her son's memory. They played 'Ballad of the Green Beret' and tears flowed, Brown remembered. Moreland's mother died April 1, 2001, but she talked to The Birmingham News in 1978 about the memorial. "I just felt this memorial was one way I can honor him," she said. "But to me he's not dead. If they could have ever found some trace of him to give me, some little something to prove they found him, I could accept it. ... Maybe someday I will." Dorothy Moreland, 81, of Montevallo, who is widower of the oldest Moreland sibling, Roger, said it is sad Parks won't see this day. But there's some comfort to be taken, she supposes, in the burial arrangement putting Moreland next to the graves of his mother and father. When they lay him to rest, "brother'll be back home between mommy and daddy," she said.